To prepare for the inspection, here are some reasons why you might fail a fire extinguisher inspection test. Every component of your fire protection system should be maintained regularly and inspected to make sure that they are in perfect working condition when you may need them. This is especially true when it comes to commercial buildings where many people need to be protected from fire emergencies. Having fire extinguishers inspected is one step that will help ensure that you have adequate tools in place to respond to fire emergencies. To prepare for the inspection, here are some reasons why you might fail a fire extinguisher inspection test. Any physical damage to the fire extinguisher that has not been addressed will likely cause a problem during your inspection test. This may include rust on the tank or any other indentions. A visual examination is just one part of the test that will determine whether it passes or fails. Debris in the hose or an O-ring that has deteriorated will cause a potential blockage in the hose. Blockages would prevent the extinguisher from operating properly. During the test, the hose will be removed and inspected by the fire safety professional who is administering the test. A leak anywhere in the extinguisher will cause it to be inoperable. A property manager, shift supervisor, or anyone else can check for leaks by reading the pressure gauge on the side. 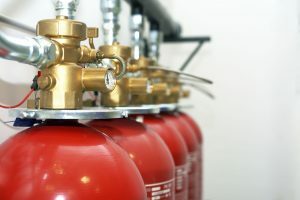 If you have a model of extinguisher that doesn’t include a pressure gauge, you’ll need to consult a fire safety professional to check for leaks during your regular maintenance procedures. If the labels are fading, partially torn, or missing altogether, the inspector will likely give your extinguisher a failing grade. It’s important that the labels attached to the fire extinguisher be visible and intact as they provide important information about the maintenance history, the extinguisher type, and even instructions. If the fire extinguisher needs to be recharged, it will fail the inspection test. After it’s been used, even for a short time, it needs to be recharged to make sure that it will operate effectively when you need to use it again. This entry was posted on Wednesday, August 1st, 2018 at 7:00 am. Both comments and pings are currently closed.